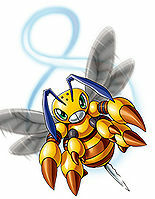 An Insect Digimon that belongs to the mysterious "aerial, covert honey base, Royal Base". 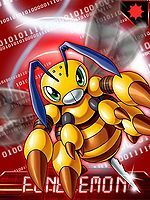 Although its daily life differs from that of other Insect Digimon, it is a strong, dedicated worker due to its personality being so cheerful. It always gets along with Plant Digimon like Palmon or Lilimon. Because the base is usually under construction, it has the duty of carrying home data left on fields of flowers or vegetation, little by little, to use as raw materials, causing it to be classified as a Virus-species. Also, because the base is defended by powerful Digimon, making it impossible to approach, the goal of that construction is a mystery at present. 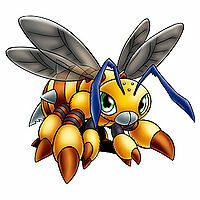 Its Special Move is rapid-firing tiny, serrated stingers (Gear Stinger). Also, because a huge crowd of its comrades are summoned when it uses its "88 Call", in which it reddens the antennae on its head and contacts its allies, it would be wisest to just run away. adj., Cheerful; merry, referring to its personality, the kana for which 「ファン」 is also a play on the Mandarin word for "yellow" (黄, Huáng). n., Any hymenopterous insect of the superfamily Apoidea. 「ファンビー」 itself is also a pun on the Mandarin word for "wasp" (黄蜂, Huángfēng; lit. "Yellow bee"). Gear Stinger  ギアスティンガー Gia Sutingā Rapidly fires tiny barbed stingers. 88 Call [N 1] 88コール Hachi Hachi Kōru Uses its antennae to summon its allies. 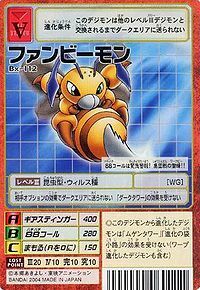 Many Funbeemon were working for Waspmon in order to attack Agumon and Gaomon. Evolves from Puroromon at level 11. 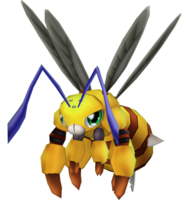 Evolves to Waspmon at level 21. Evolves to Waspmon at level 11. Evolves from Puroromon. Can evolve to Ginryumon, Omekamon, Raptordramon, or Waspmon. 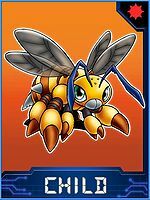 Can also Blast Evolve into Waspmon. This bee belongs to and works for the Royal Base! Its Hachi Hachi Call is an emergency alarm! A worker bee who fights in groups!! ↑ 88 reads hachi hachi (ハチハチ) which means "eight eight" in Japanese. 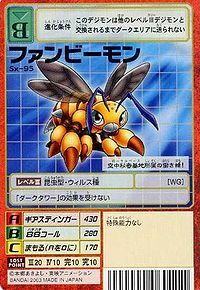 Hachi is a pun on the Japanese word for bee, hachi (蜂). Honey bees are also known to communicate by dancing in figure-eight patterns. This page was last modified on 15 March 2019, at 17:24.